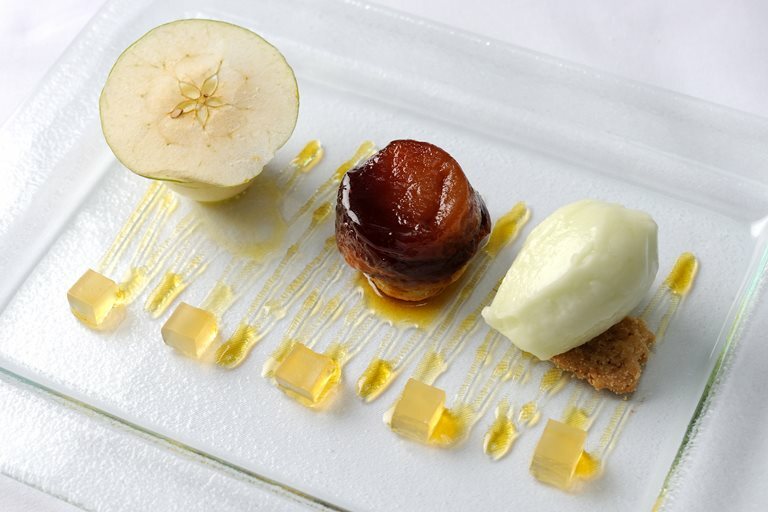 This multi-faceted apple dish from Michelin-starred chef William Drabble is a spectacular way to round off a dinner party. This recipe requires a lot of prep so make sure you leave yourself plenty of time to complete the sorbet, mousse, sponge, tarte tatin and the accompanying jelly. For the meringue, boil the water and sugar until it reaches 118c on a sugar thermometer. Start whisking the egg whites on a stand mixer, when the sugar reaches 121c slowly pour the sugar onto the eggs. Leave to whisk until cold. Make a few small incisions in the top of the pastry to let the steam escape. Put the pan onto the stove on a low heat and cook slowly until the apples begin to caramelise, you will see the sugar change colour on the sides of the pan.